Foodies, bakers and cooks will understand our dilemma. Once you find the best place to get your ingredients, do you really want to share and then everyone knows about it! We kind of feel that we have to share, but don't tell anyone. Despite its history of supplying food to New York for many generations, the area is going through a rediscovery of some sort as people like to know where their food is coming from. 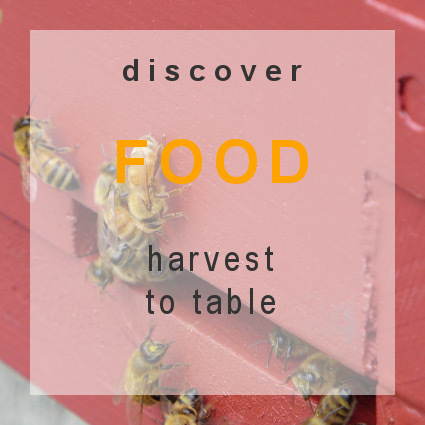 It would be a shame to call it "Farm to table" when you can participate in the food collection and go to the source. The best time to do is of course summer to fall to get not only apples but also berries and peaches. Our little hidden secret is Westwind orchard in the Catskills; not only their heirloom apples are out of this world, you can press you own cider. In winter, be lucky and try the wood stove boiled maple syrup at the Y frost valley. What do you want your next step to be? A bubbly or liquor at Clinton vineyard, a baby bourbon at Tuthilltown Spirits, and to go with it, cheese from Sprout Creek Farm (hard to find in the city), dry sausage from Jacüterie, and bread from Bonfiglio in Hudson, NY. Sometimes what you need is just to seat at a table and enjoy. From a very casual bite at Ella's Bellas (with a warm coffee) or The Hop (with a nice beer) in Beacon to an elaborate dinner at Fish & Game Hudson, just selecting a few is a shame. Hudson NY has become a foodie mecca, but the Catskills is the hidden gem with Phoenicia diner and Peekamoose. We only touched the top of the options, so in reality we still have a lot of secret spots (did we tell you about that place that grounds their own flour? ...). Now it's time to decide on where to stay.